The CyberPower PDU20SWT10ATNET, 10-outlet 1U rack mount switched auto transfer switch (ATS) PDU, provides 100-120V / 20A output. The PDU distributes power to 10 NEMA 5-20R receptacles from redundant NEMA L5-20P plugs. Dual power cords can be plugged into separate power sources to provide redundancy to single-corded equipment. If there is a power failure or an under/over voltage, the PDU will switch to the secondary power source to insure continuous operation. The PDU includes a RMCARD203 SNMP card. 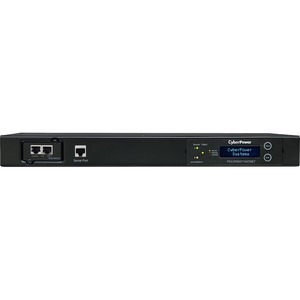 With the SNMP card and an IP address on the network interface, users have real-time monitoring and outlet control of the ATS PDU including event notifications. The LCD provides local monitoring of voltage and amperage of the PDU and on/off control of the outlets. The unit has a rugged, industrial-grade metal housing and 10-foot AC power cords. It can be mounted horizontally, includes a cord retention tray and is UL60950_1 & FCC Class A certified. A three-year warranty is standard.